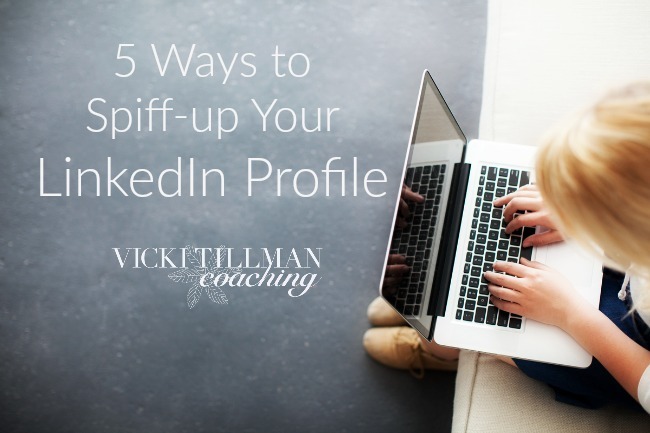 Here are 5 ways to spiff up your LinkedIn profile. Sometimes my clients balk at adding another to-do in their job hunt. But this to-do often pays off well for the effort put into it. Recruiters really do use LinkedIn to start their searches for new hires. *Use quality photos. Get a professional head-shot. (Selfies aren’t great for a professional presentation.) Carefully edit a good background photo that enhances your professional image. You can find free photos on Creative Commons or buy photos from suppliers like Bigstock.com or Lightstock.com. *SEO your profile. What are the keywords that describe the job you want? Read some job descriptions on your industries job websites or aggregate sites like Indeed, Glassdoor or Google Jobs. Use those words throughout the entire profile. *Link, link, link! Everywhere you can add the link to an article or blog post you have written or media you have been part of, link to it. This can be in the bio or the experience section. *Write eye-catching bio and experience descriptions. Use *I* statements that tell what you do or have done. Follow these with action verbs. Include outcomes, successes and accomplishments. *Don’t skip any sections. Ask colleagues and friends for endorsements. Include your interests that relate to the career you want. Like and share articles that relate to your industry so that section of your profile shows growth and development. Have someone proofread it. It’s hard to find your own editing mistakes. What locations would you work in? Your LinkedIn Profile is now more spiffy! You’re ready to be recruited! But this is just a start! For more help with the career or job hunt, contact me today.